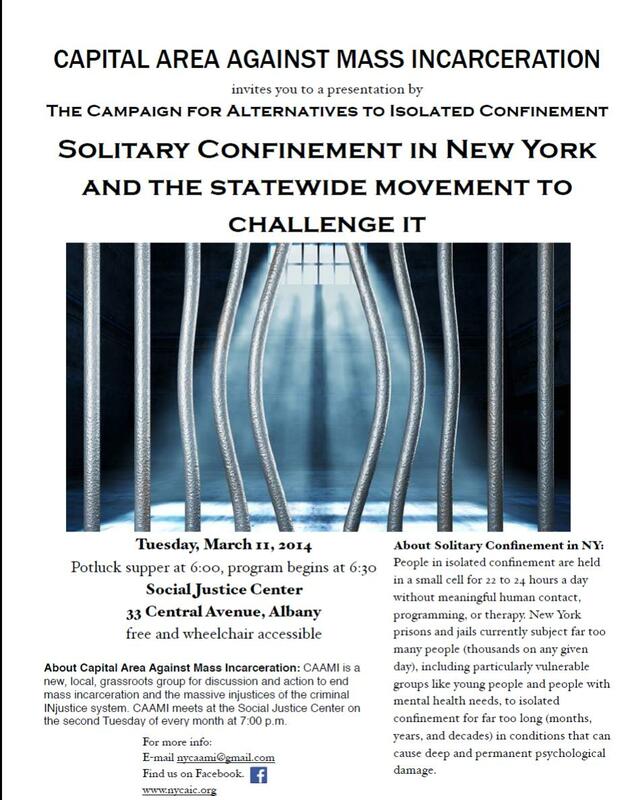 Capital Area Against Mass Incarceration (CAAMI) would like to invite you to join them for a presentation provided by The Campaign for Alternatives to Isolated Confinement: Solitary Confinement in New York and the Statewide Movement to Challenge It. CAAMI is a new local group for discussion and action to end mass incarceration and the massive injustices within the criminal justice system. New York prisons and jails subject far too many people to isolated confinement for far too long, particularly vulnerable groups like youths and those with mental health needs. The conditions that these people are put in can cause deep and permanent psychological damage. On Tuesday, March 11, 2014, CAAMI will be addressing these issues and would love if you would join them! The program begins at 6:30pm with a free potluck dinner preceding it at 6:00pm at the Social Justice Center located at 33 Central Avenue, Albany. For more information you can contact them at nycaami@gmail.com or make your way to their website at www.nycaic.org! This entry was posted in Activism, Events, Prison Justice and tagged albany, criminal justice, holding our own, prison justice, she breathes. Bookmark the permalink.